The Maine Highlands is a place where you can climb mountains, trek deep into the wilderness, and paddle wild rivers and lakes. But it’s also a place where you can stroll through modern art museums, sip locally brewed beer, soak in the sounds of a symphony, and investigate Maine’s storied past. While people often view The Maine Highlands as an outdoor lover’s playground, the area also offers rich cultural experiences for people who love the arts, music, food, and history. If you’ve never delved into the culture of this area of Maine, you might be surprised at all that you’ll find. There’s a lot to see, so we’ve highlighted some of the places and experiences that should be on your travel itinerary. Maine is known for its contemporary art scene, and travelers in The Maine Highlands will find a variety of museums and art exhibits. On every first Friday in summer, the Bangor Arts Collaborative hosts the Art Walk, where local artists, woodworkers, printmakers, and musicians of all stripes come to showcase their talents. The University of Maine Museum of Art in downtown Bangor is open to the public every day of the week and is home to more than 4,000 works of contemporary and modern art, including works by Andy Warhol, Roy Lichtenstein, Edward Hopper, and Pablo Picasso. It often showcases local Maine artists from the past and present, like Winslow Homer and Andrew Wyeth. As you make your way around the small towns of The Maine Highlands region, head to the Gallery on the Lake in Greenville. Set on the shores of stunning Moosehead Lake, this art gallery often hosts special events like craft fairs, cider tastings, and live music. With dramatic landscapes and impressive wildlife, Maine’s backcountry has inspired talented photographers to capture inspiring images of nature. At the Moose Prints Gallery in Millinocket, animals almost seem to come to life as you stroll among life-sized photographs of moose and other wild creatures. At the gallery, you can view and purchase fine art photographs of iconic animals indigenous to The Maine Highlands as well as area mountains, forests, streams, and lakes. In downtown Dover-Foxcroft, be sure to visit the historic Center Theatre, which dates back to 1939. It was renovated in the 1990s and in 2006 became the home of the Centre Theatre for Performing Arts, which hosts plays, ballet performances, and kid-friendly programs, such as the Death on Deck Pirate Dinner Theatre. The Centre Theatre also carries the major films you’ll find at any multiplex. 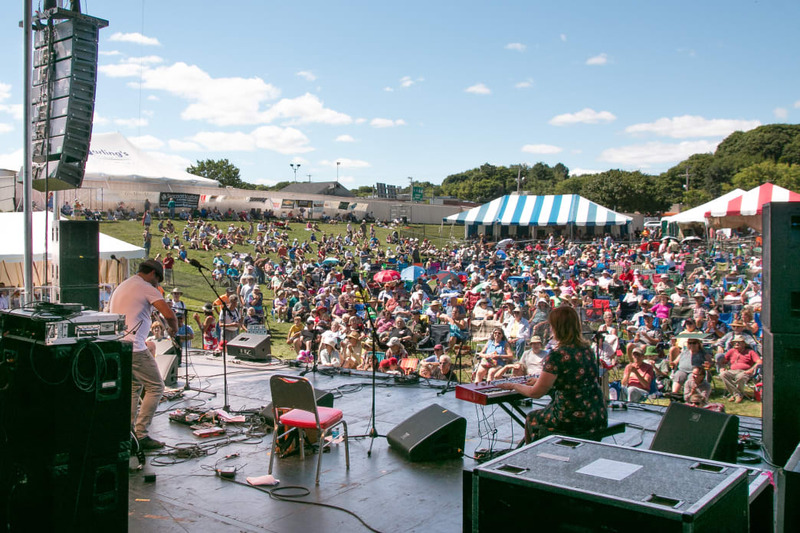 The American Folk Festival is a central event in Bangor’s music scene. Photo by Justin Russell. No matter what type of music you prefer, you’ll probably find a performance that suits your taste here. In the summer, you’ll find a wide range of well-known musical acts at Bangor’s Waterfront Concert series, which has drawn everyone from Ozzy Osbourne to Keith Urban. If your playlists are filled with classical music, the Bangor Symphony Orchestra will treat you to performances of Beethoven, Schumann, and Shostakovich. Bangor is also home to the Bangor Band, which performs concerts throughout the year, including annual Veteran’s Day and Christmas shows. Formed in 1859, it’s the oldest continuously running community band in the country. Perhaps the highlight of the music scene in the region is the American Folk Festival. The three-day event takes place in downtown Bangor, where you might catch a performance of Zimbabwe vocal harmony, New Orleans jazz, and everything in between. Just like the art and music of The Maine Highlands, the region’s food-and-drink scene mixes traditional and contemporary tastes. You’ll not only find plenty of traditional New England cuisine, but also several new and innovative restaurants. First on the agenda: have a whoopie pie (or two or three) at the Whoopie Pie Festival in Dover-Foxcroft. While there’s a debate between Maine and Pennsylvania over who invented the confection, there’s no debate over the deliciousness of a creamy filling between two soft cookies. 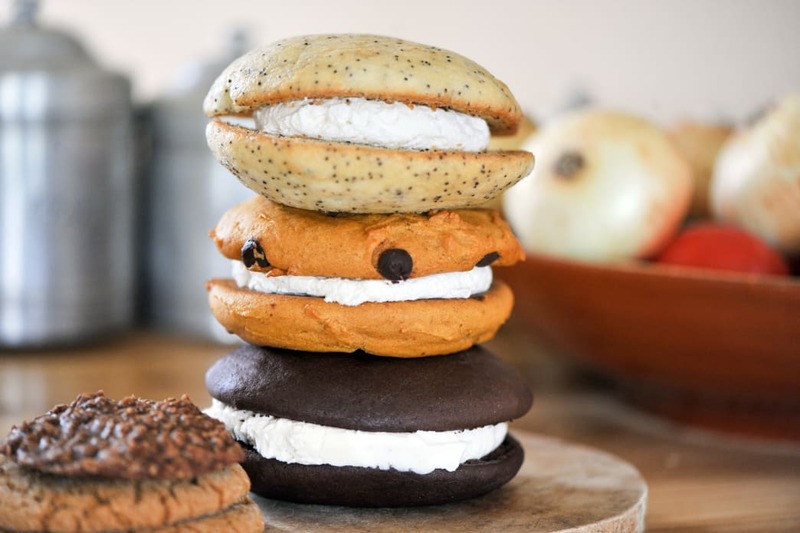 While The Maine Highlands is known for the decadent whoopie pie, it has also embraced the trend toward high-quality, healthy food made with locally sourced ingredients. In downtown Bangor, start your day at Bagel Central, which makes its own fresh bread daily. If you’re not sure what to order, you can’t go wrong with the classic Bagelwich on marble rye. From Bagel Central, walk south for about two minutes to reach Umami Noodle Bar, which is known for its delicious ramen. In the downtown area, the highly acclaimed Fiddlehead is another great spot for lunch or dinner, where they source produce from their own farm and rely on neighboring farms to supply cheeses, eggs, and honey. (If you get the cheese plate sourced from local farms you won’t regret it!). If you’re looking for a fantastic atmosphere for dining, try River Driver’s Restaurant on the edge of Millinocket Lake. With the beautiful lake providing a splendid backdrop, enjoy specialties like local lobster cobb salad or a lobster pizza. For fine dining, enjoy the farm-to-table menu at The Blair Inn, a 19th century mansion perched on a hill with spectacular views of Moosehead Lake. Sourcing ingredients from local farms and fishermen, as well as its own gardens, The Blair Inn showcases the flavors of Maine’s wild areas. The six-course dinner menu includes appetizers and salads with local greens, nuts, and honey, while entrees include iconic foods like Maine swordfish and lobster. You could argue that the best part of The Maine Highlands food scene isn’t its food at all, but rather the amazing craft beer. In Maine, there are more than 100 craft breweries (with more popping up all the time), so it might be easiest to follow the Great Beer Trail (bonus: submit your trail map and get awesome Maine-inspired swag) or take one of Bangor’s Growler buses to hit the best spots. If you only have time for a few brews, don’t miss English-style Sea Dog Brewing Company in Bangor, or head to Brewer and visit the Irish-inspired Geaghan Brothers Brewing Company, which hosts live Celtic music. 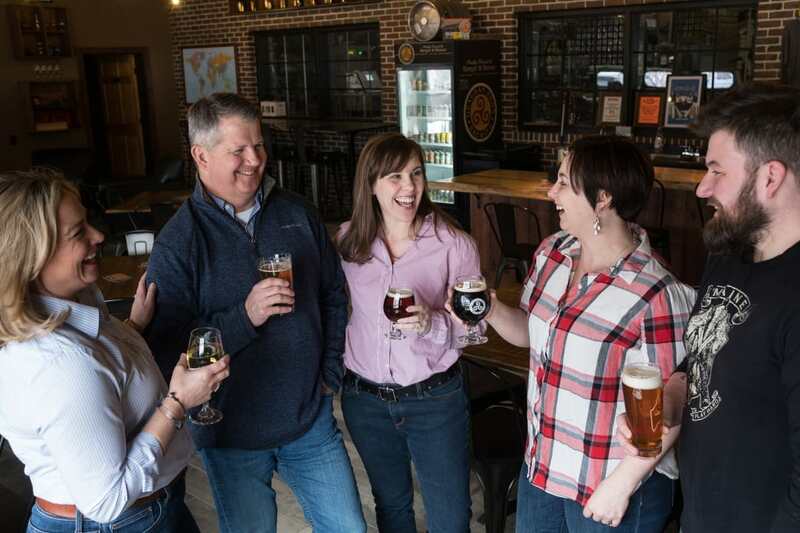 At the Orono Brewing Company, you can sample a variety of IPAs and barrel-aged beers as you relax in a rustic taproom with exposed brick walls and benches made of reclaimed wood. If you’re an adventurous beer connoisseur, try the ultra-hoppy and ultra-hazy IPAs at Three Rivers taproom in Milo. The taproom is operated by Bissell Brothers Brewing, a pioneer in the the movement toward “murky” craft beers. After you experience the art, music, and food of The Maine Highlands, you’ll have a much better understanding of the region and its people. But, if you’re a history buff and you’d like to further investigate the things that shaped the area, be sure to visit the University of Maine Hudson Museum in Bangor. Its Maine Indian Gallery includes more than 500 objects from the Maliseet, Micmac, Passamaquoddy, and Penobscot peoples, including basketry, beadwork, birchbark containers, tools, snowshoes, and three canoes. Because the logging industry had a great impact of Maine, you should travel northeast of Bangor to the town of Bradley and visit the Leonard’s Mills Maine Forest and Logging Museum. This interactive living history museum will give you a taste of life as a miller and logger in the 1790s. On the museum property, you’ll be able to see a real steam-powered log hauler and see what a 1920s mill yard looked and felt like. Learn more about Maine’s logging history at the Patten Lumbermen’s Museum. You can walk among replicas of cabins that Maine loggers called home and see interesting artifacts, such as old tools, a Lombard Loghauler, and a bearskin coat. In the museum, photographs and videos also detail the way of life for loggers. At the Patten Lumbermen’s Museum, you’ll get a real sense of how timber and natural resources shaped communities in the state. But, these days the woodlands and waterways aren’t the only things influencing The Maine Highlands. Now, cities and towns are evolving as new cultural influences impact art, music, food, and all forms of creative expression. In the past, people would gaze toward the mountains to see what defined the future. Today if you want to see what’s inspiring people, you can head to the heart of town. Written by Kayla Voigt for Matcha in partnership with The Maine Highlands. Artifacts pertaining to law enforcement with an emphasis on the Bangor Police Department dating from 1700s to the present.